I love cab franc, and only recently noticed how much of it I was drinking, how many bottles of Loire Valley Chinon and Bourgueil and AOC Touraine I was bringing home. Then this guy, a cab franc from the Languedoc, caught my eye up at Hopper's Carte des Vins on Magazine Street. To be honest, I wasn't paying that close attention and thought it too was a product of the Loire. To be completely honest, I didn't know where Cité de Carcassonne lies (or I didn't remember). The vineyard land dates back to the 1290s and skirts the medieval walled city of Carcassonne, nestled between the better known wine regions of Minervois and Corbieres. Quite romantic. 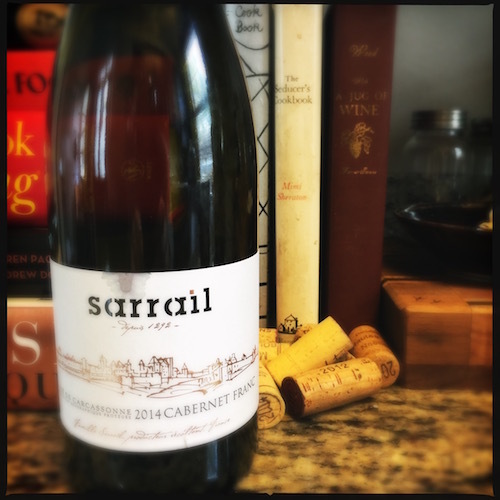 The first thing I noticed about the Domaine Sarrail Cabernet Franc is its silky tannins. Smooth and sensuous, they coat the tongue with blackberry and black currant flavors, subtle herbal notes and well-integrated acids. Hints of cocoa and earth round out the aromas and flavors with a medium plus finish. When I started to dig for details about the vineyards and winemaking, I discovered a very modern approach in a very old place. From the winery's website, I can surmise from the photos that the winery is outfitted with technologically advanced equipment - stainless steel tanks, a "state of the art" press - and the vineyards, 250 acres of relatively flat land with plenty of cleared earth between the rows, are mechanically harvested. Not my usual go-to set up for wines, this one leaning a little more to the right than ideal for me. Or too far left. I'm not sure which is which. Doesn't matter. The wine is playful and delicious and won't take up too much headspace. The perfect Friday night date.